Your tour guide will help make the past come alive. Travel back in time to the Roaring Twenties as you visit Lower East Side pubs that served as speakeasies during the Prohibition along with other hidden bars. You will have boozy fun learning about this fascinating chapter of American history. Experience what was converted from an old second-floor bank run by corrupt gangsters. See just what lies behind a real pawnshop. Learn all about the infamous Battle of Rivington Street. Say the password through a peephole to gain entrance to a real speakeasy from the Prohibition era owned by one of the more infamous gangsters in American history. Learn about who some of the colorful characters were—the gangsters, entertainers and madams alike—who brought the crowds in and kept the parties rolling right under the authorities noses as you move from one pub to the next with nary a hint of scandal. It will be the Bee's Knees! Start time is at 6 PM on Mondays, Thursdays and Saturdays. We will visit three or four pubs in three hours time. The choice of pubs will be based on accessibility yet with the early start time there should be no problem maintaining the suggested itinerary. We will meet at The Burgary, a gastropub located at 67 Clinton Street on the Lower East Side and stay on the Lower East Side neighborhood for the duration of the tour. We will walk approximately 1.1 miles on the tour between the pubs. The tour will include one complimentary beverage not to exceed $10. Tour goers will be responsible in paying for subsequent drinks. Between the pubs, you will see the sights and you will learn some of the history related to those sights. 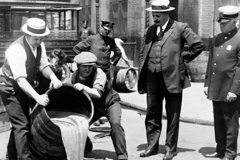 Tour content will include some true crime history on the streets and the history of Prohibition will largely be dispensed inside the pubs. Included in this narration will be the rules and regulations of Prohibition. What was legal and what was illegal. The changes the liquor industry underwent. We'll examine a few of the gangsters who had ties to the neighborhood. Learn their biographies and how they may have met their demise. We will spend approximately 35 to 40 minutes inside each pub. You will have the opportunity to drink cocktails from another era and learn about mixology. Further, most pubs we visit will have food menus as well including the original location. Tour will run rain or shine. The pub crawl will end at approximately Delancey and Norfolk Streets in the Lower East Side, very close to more restaurants and public transportation. One of the pubs we visit was an actual speakeasies during Prohibition. The other pubs are hidden or what we like to call speakeasy-inspired pubs. This will give the illusion as if you are entering a forbidden location during Prohibition. One pub sometimes takes cash only so please have some cash on hand. The other places will take all major credit cards.